Attendance at Temple University's home football games increased just slightly last season compared to the year before, continuing a loose 10-year trend of gradually increasing – and fickle – interest in the Owls team. 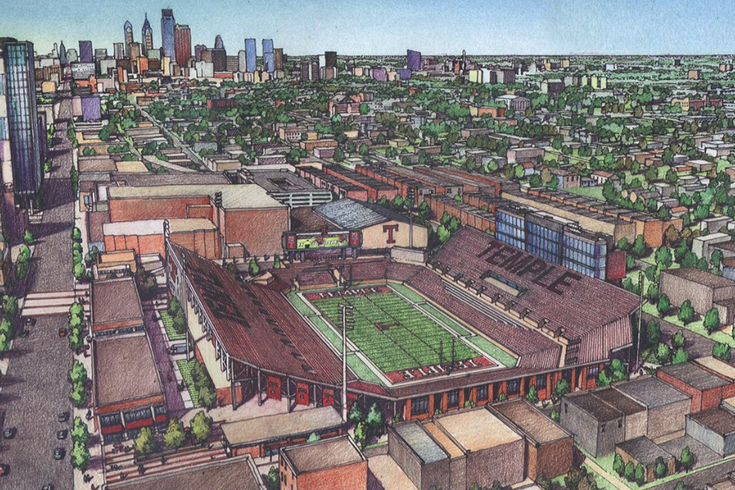 The stats, released by the NCAA on Tuesday as part of its annual data on college football attendance, come as Temple officials seek the city's approval to build a new football stadium in North Philly. Temple saw a tiny bump in average attendance at the Owls homes games at Lincoln Financial Field in 2017 versus 2016. The university averaged 27,318 fans at each home game at the Linc last season compared to 27,225 per game in 2016. That amounts to a .34 percent increase. Temple went 7-6 in 2017 and won a bowl game. The rest of college football, meanwhile, experienced its largest drop in per-game attendence in 34 years. Over the past 10 seasons, attendance at Temple football games has increased 7.5 percent. Temple's largest attendance numbers came in 2011 and 2015. Both seasons had two things in common: Team success and high-profile opponents visiting the Linc. In 2011, the team's record was 9-4 and won a bowl game later that year. Penn State and local rival Villanova both visited, helping give Temple the fifth largest increase in per-game attendance in Division I football that season. In 2015, the Owls were 10-4. The team almost won the American Athletic Conference. They scored a home win over Penn State and nearly upset Notre Dame in a nationally televised matchup. The Notre Dame game alone drew a record crowd of 69,280 to the Linc. Temple had the greatest increase in per-game attendance that year in all of Division I football, with an average of 44,149 fans per home game, 20,789 more than the previous year. That equals a 112 percent increase. The graph and chart below are based on the stats the NCAA released for Temple University. After much speculation and two years after Temple launched a feasibility study on the project, the school officially submitted a proposal in January to Philadelphia's City Planning Commission for a $130 million, 35,000-seat arena complex on the main campus in North Philadelphia. While the allure of a brand new stadium — one students wouldn't have to travel to South Philly for — would certainly boost initial attendance numbers, it's safe to say that team success and high profile opponents would factor into putting butts in the seats consistently. Besides Villanova, which historically draws larger crowds for the irregularly held "Mayor's Cup," Temple does not have any high-profile, non-conference opponents on its schedule for 2018. There is no set timeline for a potential completion date on the stadium, although Temple has only exercised its lease extension at the Linc through the 2019 season. Looking ahead at set opponents for the Owls past 2019, there already are some schools from the so-called Power 5 conferences slated to visit Temple: Rutgers (Big Ten) in 2020 and 2022; Boston College (ACC) in 2021; Miami (ACC) in 2023; and Oklahoma (Big 12) in 2025. Opposition to the stadium has been strong. Of course, none of the backlash has to do with whether Temple students and fans can fill seats. Residents argue the project would bring unwanted noise, traffic problems, parking issues and crime to their neighborhood. Members of a group called Stadium Stompers contend that school officials haven't involved community leaders enough in the planning process. 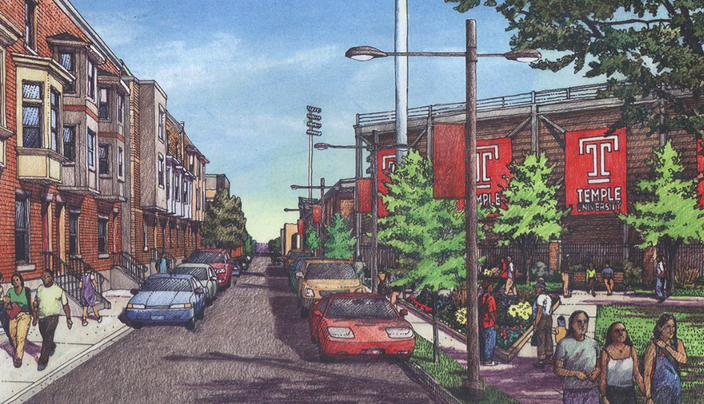 Temple maintains it has consistently involved North Philadelphia residents in the process and will continue to do so.